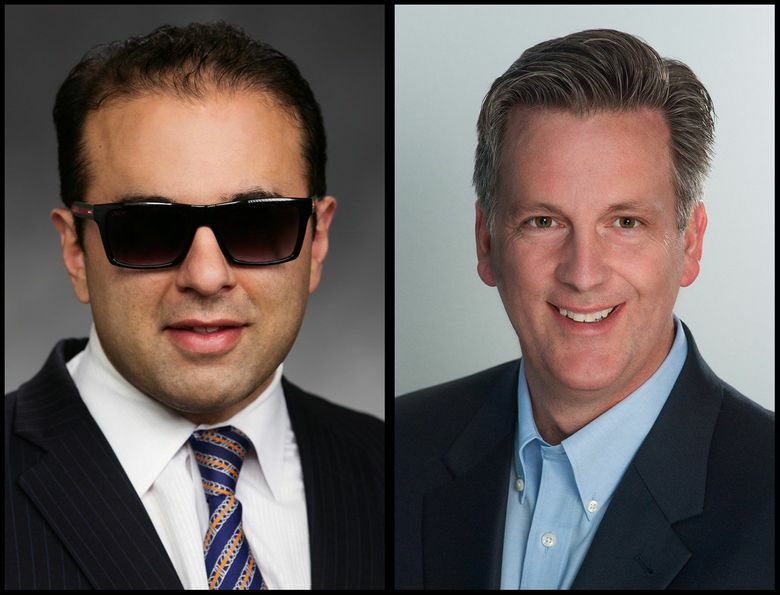 State Sen. Cyrus Habib, left, and Marty McClendon are running to replace Lt. Gov. Brad Owen, who is retiring after 20 years in office. The race for lieutenant governor in Washington state pits a progressive Democratic legislator and law professor against a conservative Republican pastor and talk-show host with no experience in elected office. Cyrus Habib, the Democrat, is an Ivy League-educated lawyer, a Rhodes Scholar, a law professor and a state senator from Bellevue. He has raised more than $725,000 in campaign donations — nearly 40 percent of it from out of state. Marty McClendon, the Republican, dropped out of college in his senior year and became a medical technician, then a Gig Harbor Realtor, a pastor and a conservative talk-show host. His campaign has raised just over $25,000. Habib has raised more than that just from donors who live in Los Angeles. McClendon has also given or loaned his campaign more than $23,000 of his own money. Among all the statewide races on Washington’s Nov. 8 ballot, there may be none that offers a bigger contrast in candidates than that of lieutenant governor, which pits an ardent Donald Trump supporter against a self-described progressive who has professed a more ideological bent toward the office than the incumbent Democrat. The race to replace Lt. Gov. Brad Owen, who is retiring after 20 years in office, drew 11 candidates for the August primary. Habib won the primary with about 22 percent of the vote to McClendon’s 19 percent. But the four Democrats in the primary got a combined 58 percent of the vote, compared with 38 percent for the four Republicans. Habib, 35, is a lawyer with the Seattle firm Perkins Coie, where he’s worked with startups and tech firms, and a law professor at Seattle University. He has been blind since age 8, when he lost his vision to cancer. A former state representative, now a state senator, he is the highest-ranking Iranian-American elected official in the country, according to the Public Affairs Alliance of Iranian Americans. McClendon, 49, was an anesthesia technician for 13 years, before switching to real estate in 1999. He became a licensed pastor in 2002 and launched the small (seven families) Gig Harbor Family Church in 2013. In 2015, he and his co-host, Doug Basler, who is challenging Democratic U.S. Rep. Adam Smith, started “Eyes on Washington,” a nightly drive-time conservative talk show on 1590 AM. Both McClendon and the station manager said there was no issue with political candidates hosting the show because McClendon and Basler pay for their airtime and rarely discuss their own campaigns. The lieutenant governor has an eclectic set of duties, some in the executive branch and some in the legislative branch. He (there have only been hes, so far) acts as governor when the governor is out of state, and assumes the office if the governor dies or leaves office. The lieutenant governor also presides over the Senate, settling procedural disputes and breaking ties, and chairs the powerful Senate Rules Committee, which can kill any piece of legislation. Habib, in drawing the contrast with his opponent, pointed to the Republican nominees for U.S. Senate and for governor, both of whom have disavowedTrump and are running as moderates. McClendon agrees that he’s probably the most conservative candidate running for statewide office but doesn’t see it as an issue. On presidential candidates: Habib was once an intern in Hillary Clinton’s U.S. Senate office and endorsed her in March, in advance of Washington’s Democratic caucuses. McClendon initially supported U.S. Sen. Ted Cruz of Texas, but is now an enthusiastic Trump supporter. On his radio show, McClendon calls Wednesdays “Trump day.” After Clinton announced her recent bout with pneumonia, he and Basler mused not just about her health, but about whether she is actually still alive, comparing her to the movies “Weekend at Bernie’s” (starring a propped-up corpse) and “Dave” (where a look-alike fills in for a comatose president). On guns: Habib wants to ban all guns from the Senate chamber, after Owen banned openly carried guns last year while continuing to allow concealed guns. Habib was one of a horde of Democratic lawmakers standing behind Attorney General Bob Ferguson when he announced a proposal to ban military-style assault rifles earlier this month. The next day on his radio show, McClendon, who said he would vote against “any kind of gun control,” talked about Ferguson’s proposal as akin to a government conspiracy. The polarized nature of the race has sparked some unusual alliances. The last Republican nominee for lieutenant governor is supporting Habib, the Democrat. Bill Finkbeiner, a former state Senate majority leader and the Republican lieutenant-governor nominee in 2012, said he has never met McClendon and has nothing against him. Meanwhile, Owen, the Democratic incumbent, is not publicly supporting Habib. Owen doesn’t plan on endorsing either candidate. McClendon countered that he would bring a “new perspective,” having never served in state government, and noted that former Lt. Gov. John Cherberg, who served for 32 years, until 1989, was the University of Washington football coach before taking office. The contretemps largely concerned Habib’s statements that he would not sign a bill he views as unconstitutional, referring specifically to a budget bill that did not comply with the Supreme Court’s McCleary decision ordering an increase in state education funding. The lieutenant governor, as president of the Senate, signs bills to confirm they have passed the chamber. Habib said that withholding his signature wouldn’t act as a de facto veto, as Owen alleged, and that the Senate president pro tempore could always sign a bill in his place. Owen disagrees, vehemently, saying it is not in the job description to judge a bill’s constitutionality — that duty lies with the state Supreme Court. McClendon sides with Owen. “If it’s been passed by the body, I’m going to sign anything they bring forward,” he said.